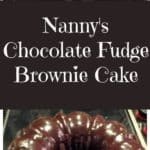 Nanny's Chocolate Fudge Brownie Cake is a keeper recipe! Easy to make and perfect for chocolate lover's.This is also freezer friendly if you wanted to make in to portions or make ahead for a party! Nanny’s Chocolate Fudge Brownie Cake is a keeper recipe! Easy to make and perfect for chocolate lover’s.This is also freezer friendly if you wanted to make into portions or make ahead for a party! Nanny’s Chocolate Fudge Brownie Cake! Oh boy! 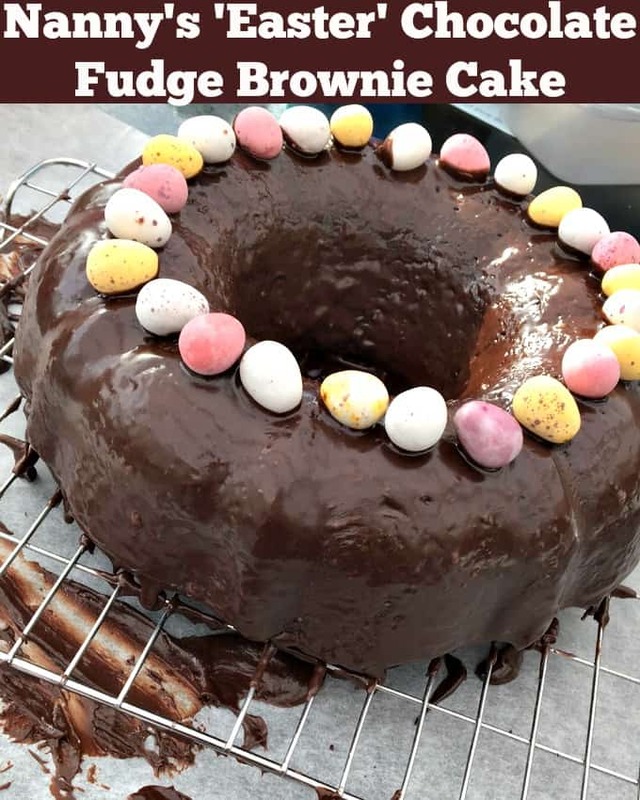 Nanny’s Chocolate Fudge Brownie Cake is certainly very popular, with over 1 million shares across social media, you can rest assured, this cake will be a hit when you serve it up. It’s perfect for parties, potlucks, Christmas and Thanksgiving time, Easter.. in fact, any time! **We have had a few comments from our readers who have said some of the batter spilled over in the oven. Please please make sure you DO NOT NO NO NO use the ingredients listed on the box mixes, just the ingredients listed below. Then you should be absolutely fine with no chocolate fudge volcanic eruptions happening in your oven! Some of our readers have made this just on it’s own, some have added the frosting and others have made up their own frosting recipe. Whichever way you decide to make this, please enjoy! And if you’re baking for just one or two people, why not cut the cake in to slices and wrap individually and freeze. At least you’ll have a nice little supply of nanny’s cake to hand when you get that craving! 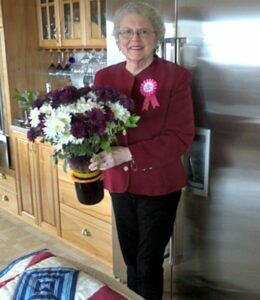 In the photo below, Nanny’s sliced some of her chocolate fudge brownie cake and put in boxes to take for friends. Of course they all loved it! Last week I made nanny’s chocolate fudge brownie cake but added an Easter touch to it. I was going to a school reunion and since it’s coming up to Easter I thought what better than to bring a cake along for my old school friends to enjoy! The photo below just gives you an idea of how you can decorate it for any occasion, Easter included! **Note: you do need to make sure the little chocolate eggs have set in to the frosting before transferring to a plate / container otherwise they will roll off if the frosting is still wet! 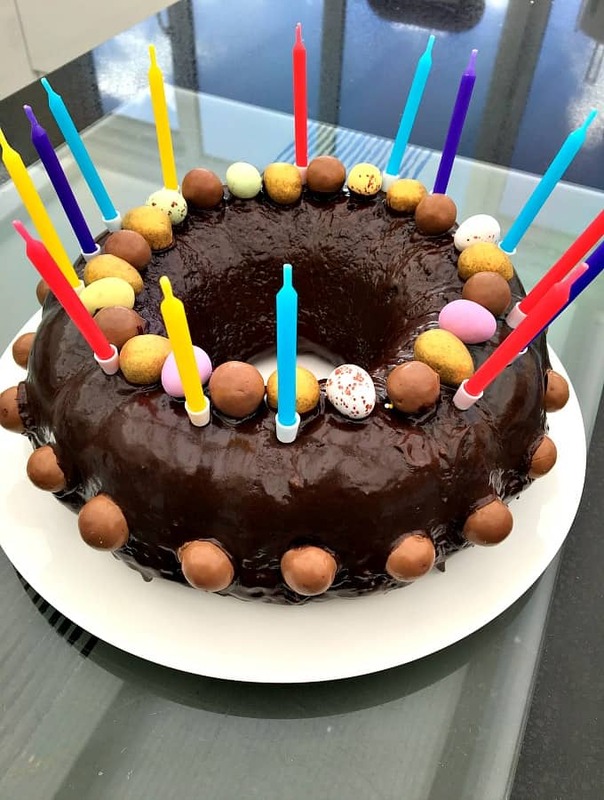 Here’s Nanny’s chocolate fudge cake made by one of our readers, Ruby. Ruby made this for her son’s 14th birthday, like a UFO Spaceship. It looks great! 1. Preheat oven to 350 F. Grease and lightly flour an 8 – 9-inch bundt pan ( I use Baker’s Joy spray). NOTE*** Do NOT use the ingredients on the brownie mix and cake mix, just what is listed above. 2. In a bowl add the cake mix, brownie mix, oil eggs and water. Pour into bundt pan and bake 50-55 minutes or until toothpick comes out clean. The photo below is when I baked Nanny’s chocolate fudge brownie cake, I didn’t use a toothpick but a cake skewer. So cute! Here’s a similar baking skewer I used in the photo above if you’d also like to get one! 3. Let cake cool completely after waiting 10 min. out of the oven onto a cooling rack and then transfer to serving plate. 4. In a small bowl, add 1/2 tub of ready to use cake icing, and melt in the microwave 30-45 seconds until it is able to be drizzled over cake. We’ve also found this lovely Kitchenaid mixer, it’s great for making cakes, cookies, bread dough.. so many things! If you haven’t got one, we can recommend this. I have a red one and a silver one! Here’s a couple more lovely classic Birthday Cake recipes we can recommend, and so popular too! and Best Yellow Birthday Cake Recipe with a Mocha Frosting by Serena Bakes Simply From Scratch. Be sure to check those 2 out! Have you tried Nanny’s Best Chocolate Brownie Muffins yet? They’re really good! 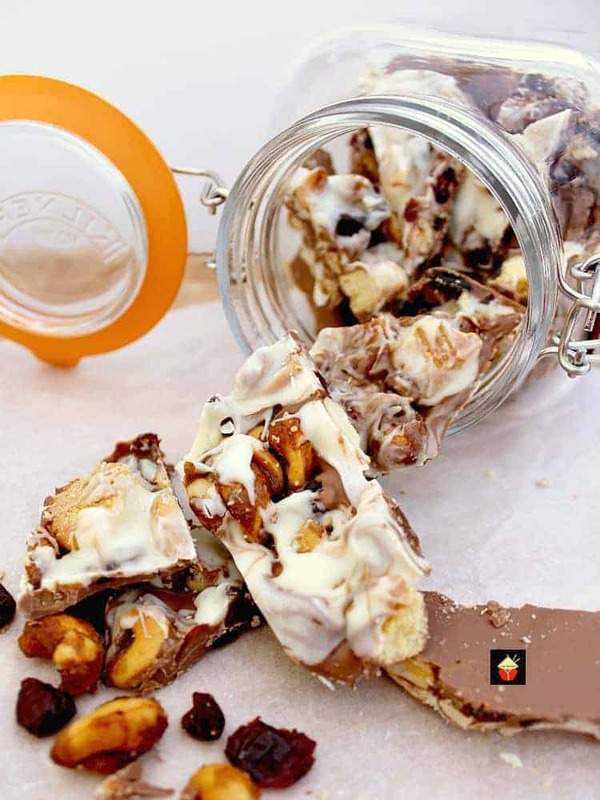 For big chocolate lovers, try our Irish Cream Chocolate Bark. Always popular at Christmas time too! Another lovely cake for you to enjoy is our very popular Easy Cinnamon Swirl Loaf. It’s another keeper recipe! 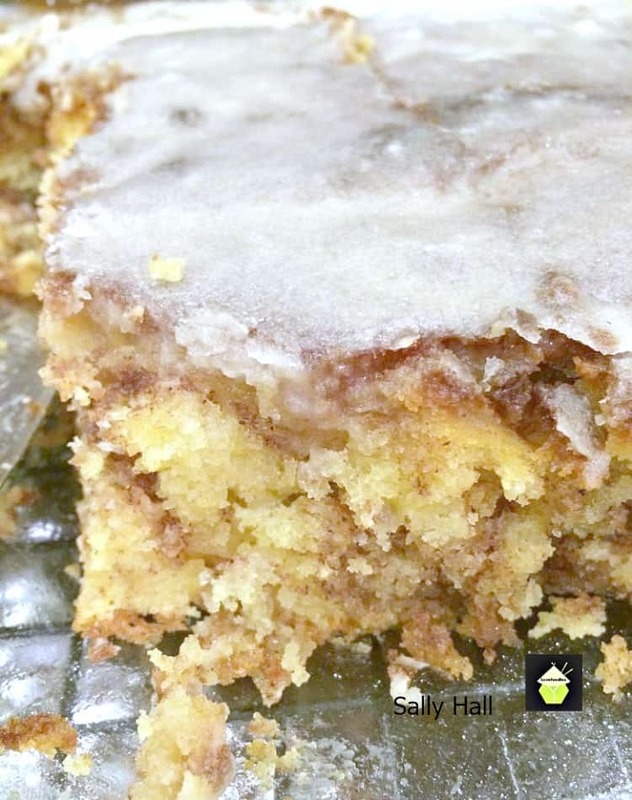 We’ve also got a delicious really easy Honey Bun Cake, great for crowds and cake lovers! 1 box chocolate cake mix I used Betty Crocker's Choc. Fudge 15.25 . 1 box fudge brownie mix I used Duncan Hines Decadent Brownies 17.6 . Preheat oven to 350 F. Grease and lightly flour a bundt pan ( I use Baker's Joy spray). In a bowl add the cake mix, brownie mix, oil eggs and water. Pour into bundt pan and bake 50-55 minutes or until toothpick comes out clean. Let cake cool completely after waiting 10 min. out of the oven onto a cooling rack and then transfer to serving plate. In a small bowl, add 1/2 tub of ready to use cake icing, and melt in the microwave 30-45 seconds until it is able to be drizzled over cake. I made the chocolate cake and substituted orange juice for the water and added 1 tsp orange zest. Homemade whipped cream frosting. Drop dead delicious!!! 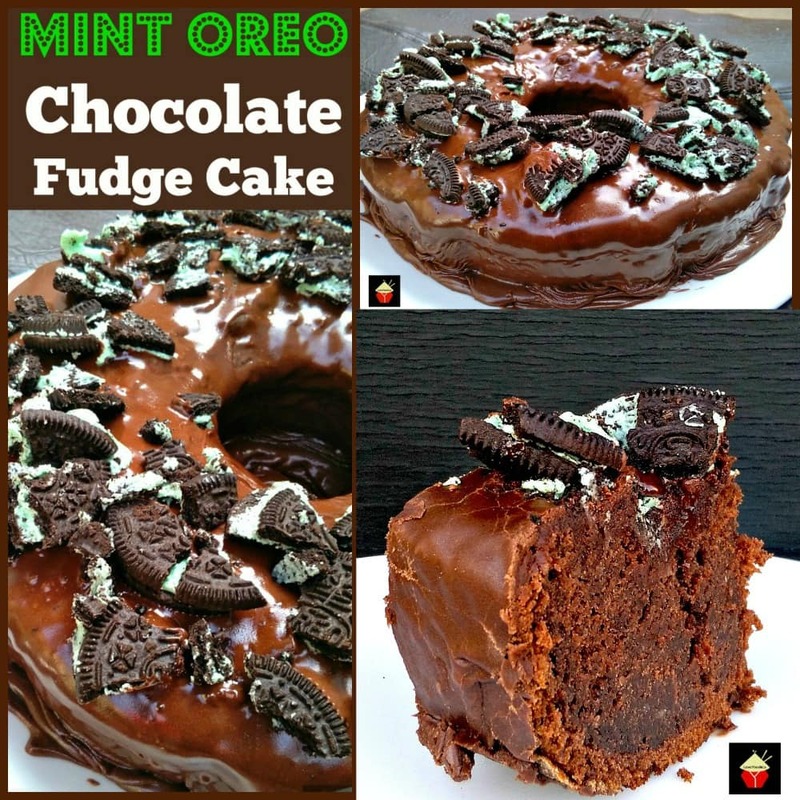 I’m wondering if this cake can be made in a 13×9 pan and if I should double recipe but how long would you say to cook if for? Can this be made in a 13×9 cake pan?! Hi Sheila, yes of course! For that size pan I would suggest doubling the ingredients otherwise the cake will be quite thin. OMG, this chocolate cake is the best ever and always a huge hit at family gatherings. I make this so often. It is so moist, soft and flavorful. It fills the whole bundt pan. I never put icing but i sprinkle powdered sugar or leave it plain. Nobody can wait for the cake to cool, the gorgeous chocolate aroma fills the whole house. Thanks for this recipe! May you always be blessed. I’ve made this before and it is always a hit. I’m going to make it for Bible Study in a couple of weeks but would love to give it a Christmas touch? Any ideas? I love this website and have never had problems with ads . Hi Regina, so happy you love the recipe! For a Christmas feel, you could add some red and green sprinkles if you wanted to keep it easy to do, or add some little icing Christmas shapes which you can get in the baking section of the store or via Wiltons on amazon. I often use the icing shapes with a Christmas tree, holly etc for decorating. If you wanted to be really adventurous you could make up a simple vanilla frosting and make it like snow or divide it in two amounts, color one red and one green and pipe it on the cake. Do you use the little packet of fudge sauce that comes with the Betty Crocker cake mix? I have two 6” bundt pans. Can I divide this cake so I can share one? We’re seniors and can’t eat a whole cake but I love to share with elderly neighbors. How would you adjust the baking time for the smaller pans? Thanks in advance for any help. Hi Karen, try reducing the cook time by around 8-10 minutes and keep checking. That should do the trick! Does anyone know if high altitude adjustments are needed for this recipe? The recipe says not to follow box instructions, which do make adjustments for high altitude. I made this in Kansas and Colorado. In Colorado, there’s a trough in the cake. Still delicious, but seems to have a different consistency. Hi Susan, sorry to find the cake wasn’t the same in high altitude. For the recipe where it says not to follow the box instructions, it was because a lot of people were adding ALL the ingredients stated on the box and also those in nanny’s recipe so you can imagine the ratios would be wrong!! For the baking temperature / time, it is probably a good idea to take note of any recommendation for high altitudes and just keep an eye on the cake whilst it’s baking, just make sure you don’t follow any instructions for adding any of the other ingredients like egg etc that is on the box! I am trying this recipe with a GF cake mix and a GF brownie mix. I will let you know how it works out. I made this GF with a GF cake mix amd GF brownie mix. With the exact ingredient proportions as the original recipe. And it turned out great and was delicious! I would include a photo but I do not see how. Hate this website. So many ads it’s almost impossible to follow the blog post. I can get better recipes elsewhere. Made this recipe last night using the exact ingredients and it turned out great. It even looks just like her picture which is ever unusual because none of my recipes ever turn out just like there. I truly will be using this as a go too. After reading some of the remarks I was surprised mine did not over flow or under bake. I too used I leaf type Bundt pan and it was done in correct amount of time. Thank You so much for sharing your recipe, please continue to send me more. This cake was delish. I only changed one ingredient, I put a box of instant chocolate pudding 3 1/2 oz box, jello brand. Awesome cake. I followed the recipe exactly, except I used 2% milk instead of water. I baked it at 350 degrees and it was done at 45 mins. It came out dry. 😥 Any suggestions??? Easy to follow directions, family LOVED it! Can this recipe work in round or square cake pans for a Grooms cake? The last two events I made this cake for were auctions and the cakes went for $100 each! I’m making this recipe right now for the first time! Patty – that sounds so amazing! Would you be willing to share your homemade Caramel icing? I would love to try it with this recipe! Hi Holly, Thanks for writing in. Just in case Patty doesn’t reply (not everyone chooses to get a notification on the comments! ), we have a fabulous caramel icing recipe here, (just head straight to the icing part of the cake recipe). https://lovefoodies.com/caris-oatmeal-cake-and-caramel-icing/ . It’s all homemade and very popular. The quantity in the recipe will need to be halved as I think it will be way too much for a bundt cake. Hope that helps and happy baking! 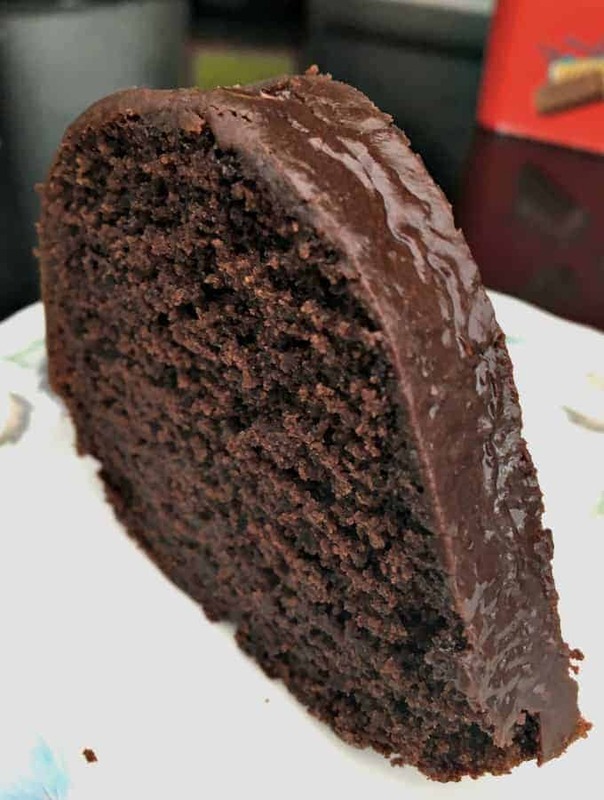 This is my go to chocolate cake, I’ve tweaked it a few ways to make it my own, like adding an egg, using milk instead of water (even chocolate milk), and butter instead of oil. I make ganache also instead of store bought icing, I get rave reviews. Never dry and doesn’t overflow. Love this cake. This cake was very delicious! Very moist! Will definitely be making again. 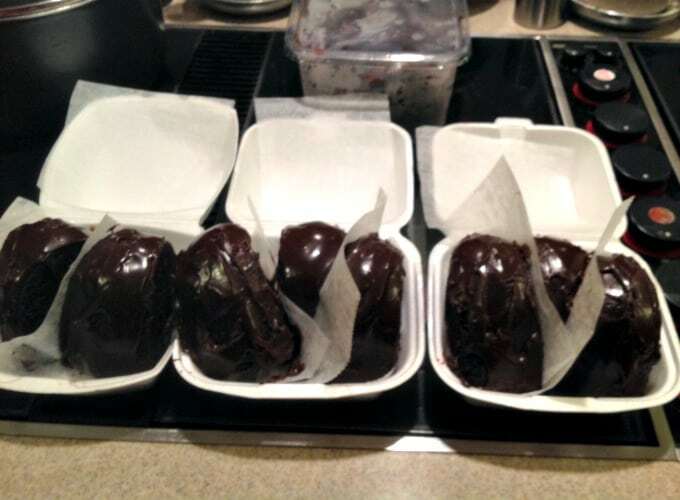 But I use a chocolate Ganache, for the icing..
My family, and customers, seem to like this icing…. Made this cake for Easter. I didn’t have any problem with overflowing but it was dry. It was okay but not sure I’ll make it again. I have used this recipe several times and it is great! I use milk instead if water and I add a table of instant coffee to deepen the chocolate flavor. The milk removes any traces of it being a box cake! I do make my own ganace instead of using store bought frosting. I was a baker for many years. Takes a lot to impress me but this one gets my approval! Thanks! This is now my new favorite chocolate cake. It was so moist and probably important to follow the recipe to get that. I couldn’t find that brownie mix but it was great with dark chocolate brownie mix! I used the frosting recipe below with butter, milk vanilla and powdered sugar and it was divine! I’ve made 3 now for different occasions ❤️ Thank you! Hi Stephanie, yes of course. Just be aware the cook time will be much less, around 15-19 minutes for regular size cupcakes. Enjoy! Made this delicious cake today in my bundt pan and it was a hit! I never use canned frosting. So I just used my easy fudge frosting. Bring 1 stick of butter, 3 tbsp cocoa and 3 tbsp milk to boil in a saucepan, remove from heat. Add 1 tsp vanilla and app. 1 lb confectioners sugar beating with mixer to desired consistency and pour over cake. Yummy! I have made this Cake twice now. I served it with Whip Topping and Caramel Sauce. My Family loves it. Great recipe. I have made it numerous times and it turns out perfectly. I made this cake for my husband and daughters. They loved it! I served it with vanilla ice cream. I did add mini nestle morsels to the batter. I definitely will be making this again. This is my absolute new favorite chocolate “cake” of all time!!! This will be my new go-to for any type of gathering. I CAN’T STOP EATING IT! I did end up baking it for 47 minutes and although mine did not overflow like others it did come all the way up to the top of the bundt pan. I used ganache as my frosting and highly recommended to chocolate lovers. 🙂 Thank you so much for sharing this recipe on Pinterest! I made this delicious cake today. It was a big hit with my wife. I will definitely make this again. Thanks for sharing. Made Nanny chocolate brownie cake tonight. It was to die For! Used a chocolate glaze with BOURBON for my icing and it was yummy. I made this for my sister-in-law. It turned out AWESOME!! I will never use another chocolate cake recipe again!! I wish I could post a picture. It looked awesome! Thanks again. Tried this Recipe last night it was delicious 😊. I added crushed walnuts to the drizzle Looking forward to the next holiday. ( can’t afford to have this cake around the house any other time or my weight loss will be in vain. ) May try the milk chocolate or Carmel drizzle next rime. I wasnt sure if I should use the fudge packet that came with the brownie mix. (I bought the exact one you suggested). Did you use it or discard it? I also did not put all of the batter in the Bundt pan and I’m so glad I dad that because I’m sure it would have overflowed lol. I’m sure it just depends on the Bundt pan. I put the rest of the batter in a tiny loaf pan and I filled it haha. It’s overflowing like crazy! I’m glad I put a sheet pan under it! I’m hoping it turns out! I’ll let you know! 😃 I love trying new things! Pillsbury sugar free cake mix and the sugar free brownie mix? I never can find the chocolate cake mix and was wondering about using the yellow one plus brownie mix and adding 3-4 tblsp of cocoa for more of a chocolate flavor and add 1 tsp of vanilla? I made this cake in tube pan (not bundt) and had no spillage. I made my own chocolate fudge icing and it was perfect. I also used chocolate fudge cake mix and chocolate fudge brownie mix. I think it makes it more moist than regular chocolate cake and brownie mix. If too dry try s bit less wayer and a bit more oil. I am not sure what I did wrong and have been baking for years. The ingredients for this cake was simple enough. I baked 60 minutes, cooled five minutes, removed cake from pan but when I did the inside chocolate poured out but the cake stayed in place. It was like it was a cyst. So I put the cake back into the oven for 15 more minutes but guess that was way too long being that most of the inside had run out. I could have had my onwn comical baling sitcom. I used a Bundt pan but it was one of those fancy leaf designs and I didn’t use the cake or fudge brownie brands you mentioned. I can’t imagine what went wrong, unless my oven is not working correctly. The same happened to me! Thought I was just stupud..
OMG, I will only ever use this recipe for any chocolate cake I ever bake again! It is delicious and soooo easy! Thanks! Can I use red velvet cake mix instead of chocolate.? I did the recipe exactly as you stated and after 25 minutes of baking time it was spilling all over my oven. This cake is very good, I added pecans and sprinkled sugar sprinkles on the top for that little extra of YUMMY!!!! I made this for thanksgiving. It was a hit! My son thought i bought it so they were all really impressed! Thank you ! I made this for a brunch. WOW ! They didn’t even leave crumbs. It was moist and as bsolutely delicious ! 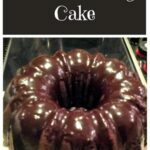 I’ve made this cake several times and even used a min bundt pan and each time it seems more delicious. Thank you for this great recipe! Are you supposed to mix by hand or with a handheld mixer? How many minutes are you supposed to mix together, or do you mix just until blended? Do you mix by hand or with an electric mixer? Hi Judi, do whichever way suits you. It will be perfect either way! Made it for a college Bible study and it was gone before I knew it. I used a 9 inch bundt pan and a mini bundt pan for the one batch and they both rose up to the top. Followed your directions but used a costco brownie mix which is 20 oz. vs your instruction of 17 oz. Perhaps that is a reason for the overflow some have experienced. So easy and I plan on making it again tomorrow! Used a chocolate ganache ( chocolate chips and whipping cream) glaze for the icing. I made this AWESOME cake yesterday for my friend’s birthday who loves chocolate. I used Betty Crocker chocolate cake mix and Gheradelli Dark chocolate brownie mix with chips. My husband was supposed to pick up chocolate icing and grabbed COCONUT & Pecan icing by accident! ( MEN…..!) Anyway, I mixed everything as planned and as I poured the batter into my 10″ bundt pan I poured 1/2 batter around and then took the coconut/pecan and globbed it on . I tried to keep it in the middle so that it would be a surprise filling inside each cut piece. Then I poured the rest of the batter evenly on top of it. I put it in my Electric oven on 350 degrees and in 40 minutes it was smelling a bit like it was burning. I took it out and tested with a toothpick and it was DONE except 1 spot came up a bit on the toothpick. I figured it would still cook more on its own because I was afraid it would BURN bad! I cooled it in refrigerator and to my surprise when I turned it upside down to remove the pan…the coconut/pecan mixture had NOT stayed in the middle but had SUNK to the bottom of the pan which now was the TOP of the cake since it was removed from the pan. Some of the coconut/pecan mixture stayed stuck in the pan but it did NOT burn so I scraped the gooey stuff and put it on the top of the cake where it needed it in a few spots! It looked like a topping that was MEANT to be on top! It was the BEST CHOCOLATE CAKE you have ever eaten! 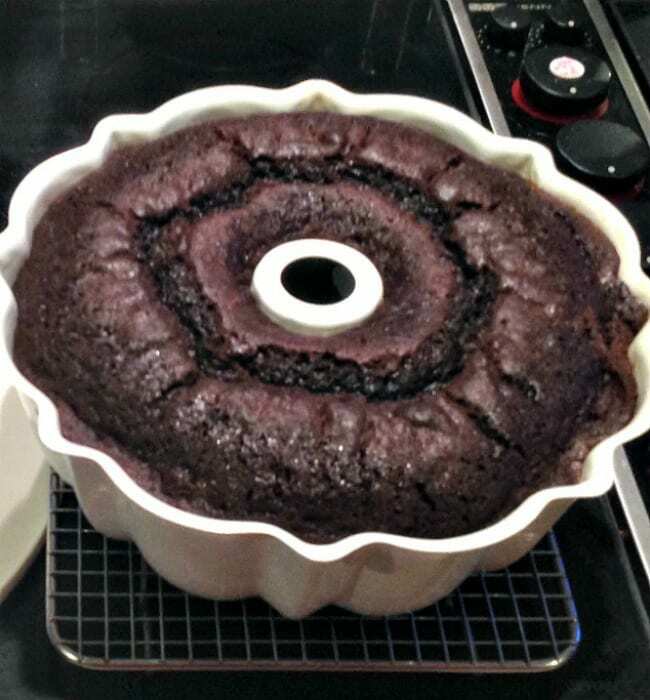 It was about 1 1/2 – 2 inches higher than the bundt pan but NEVER overflowed! It was Huge and everyone had a 2nd piece! It was amazing!! Sometimes a MISTAKE turns into a HAPPY MISTAKE! I don’t understand some of the bad comments about it being dry because it was Flavorful and so very moist! Just remember to check at 40 minutes because had I NOT checked and removed it, another 5 minutes would have burned it! GOOD LUCK! This cake turned out great! I used a 10 inch bundt pan, added some chocolate chips, (2 handfuls) and baked it for about 48 min.. This recipe is so simple and delicious. It is a keeper!! This is my go to chocolate cake. I bake it in three 9″ round pans. It makes a nice, dense, moist cake and people always ask for the recipe. Sometimes I bake it in advance & freeze it until ready to frost. Salted caramel frosting has been a favorite in our family. MAde for family Sunday night. It was a big hit. A perfect blend between cake and brownie. While the picture looked delicious, the actual cake did not taste that great. Wish I would’ve just made a plain chocolate cake, or plain brownies! It sounds really good . Could I make it and freeze it . Company coming in a week and I like to bake and freeze . Yep, freeze away Michel! I would advise to simply do the glaze after defrosting because the freezer will affect the color on the glaze and might make it go a whitish color. Have a lovely time with your company! I thought it was kind of dry. Love the cake! I only made one change. Instead of the chocolate icing, I make a homemade caramel icing and drizzle over. I always bring home an empty plate! Can I use apple sauce instead of oil? Made it exactly like the recipe using the exact mixes except I substituted coffee for the water! It baked beautifully. I haven’t tasted it, as I’m taking it to an event.. it’s beautiful, though. I am making ganache to pour over it. Yum!! I made this cake and it is absolutely wonderful. I’m making another one today for company. Everything is perfect about it. I know it goes without saying (to much at least) but the 1 oz box of cake mix….. kinda made me nuts. I figured a type-o since I have seen that on several write ups. I have baked this cake three times and it has turned out great all three times. I place both mixes in the bowl and mix them together then add eggs, water and oil using a hand whisk mixing for 2 minutes and pour into a prepared pan and bake for 55mins. I use Crisco shortening and dust with coco powder to prepare my pan. For the frosting I make a chocolate ganache. Half a cup of heavy cream heated in the microwave just before it boils take out and add a half a cup of semi sweet chocolate chips, let set for 5 minutes. Then just stir until it’s smooth and creamy and pour over your cooled cake. Also I use a Nordic Ware bunt pan and Duncan Hines swiss cake mix and Duncan Hines chewy fudge brownie mix. Cake number three is cooling as I type this. One of the best cakes ever with coffee the other cake good with coffee is a Kentucky Butter cake, look it up on pinterest. I normally do not comment on things but I must here. I followed the directions exactly and it turned out great. I was a little worried it would overflow the pan while cooking but it didn’t. My very picky eight year old who does not eat cake asked for a piece. She loved it! This cake recipe is definitely a keeper. I tried this cake and it made a big mess in my oven. I’m not giving up I think next time I will do half a box of the brownie mix. I have madecthis several times, i use no water 1/2 cup of oil, and a dry dark chocolate instant pudding mix. I had 1 reg bundt, and 7 mid bundts. I did on the last one add a psuedo reeses peanur butter mix as a surprise insert. A really good cake. I made this just as directed and it came out dry. How can I correct this? I have made this cake four times. I needed more liquid as the first attempt was dry. I add 4 tbsp of melted butter, and 4 oz of sour cream, and a extra egg. I also use a extra egg, throw in a handful of chocolate chips and a tsp of vanilla extract. I use a large angel food cake pan. Drop the oven temp down to 325 degrees, bake 40 minutes, watch carefully do not overbake. Could this be made ahead & frozen? I absolutely LOVE this cake!!! Will this work as cupcakes? I like to make bundts and cupcakes. So I took this recipe and made cupcakes. I got 30. I used coffee in place of water, with a rounded tbsp of instant coffee added, I also added a pkg of instant dark fudge chocolate pudding. I also as other commenters 3/4 cup oil n 1/4 cup butter. The 24 is cooling. Took a photo don’t see a way to add…. This recipe was very short on instructions! So here are my tips. Too much batter for a 10 inch Bundt pan. Next time I will take out about 1-1/2 cups before baking. I used my mixer to combine ingredients, about a minute. The frosting takes about 30 seconds in micrwave to get pourable. It took 55 minutes to bake. Wait until cake fully cools to pour frosting over it. I thought so also. Thanks for the additional tips. I made this cake tonight and it couldn’t have have turned out more perfect. It was So rich and delicious!! Love love love! I would like to bake this cake in a 13×9 pan. How long should it bake? How would this work in an angel food cake pan? You can’t see recipe. This is ridiculous! I used a yellow cake mix and a brownie cake mix. I put chocolate icing, and drizzled with caramel. Its really good. Do you think it would work as a poke cake? Love this easy and delicious cake. I added 3/4 cup mini chocolate chips! I made this cake tonight in the specified bundt pan and my pan runneth over. I wish I went with my first mind to put some in a loaf pan but after reading the comments that had the same problem, I will next time. Haven’t tasted it yet but it smells yummy! I’m sure my coworkers will love it. Flavor was really great! Use a 9 inch bundt pan, but my batter overflowed. I made this brownie/cake once and it was so good I’m fixing to make another one. I used my pampered chef stoneware Bundt pan and it worked great. I didn’t put a lot of icing on it because it just didn’t need it. This is definitely one of my favorite chocolate cakes. I want to make this cake but I live at a high-altitude (8,000 feet). Is there anything I need to change in the recipe to accommodate the altitude? I’d really appreciate your help on this! Thank you! I made this once, and too much batter for the bundt pan.. it baked out of the pan, I made it the second time filling my bundt pan to a safe level and I poured the remaining batter in a prepared loaf pan, baked both together for 45 minutes.. came out perfect. I will be making this again, it is delicious. Thank-you for sharing. I’m going to make this for my Bonko ladies in March. Never made it before so I’m a little anxious. After reading the reviews I’m feeling confident about how it will turn out. I’m going to put just a little twist of my own into the mix. I’m going to add butterfinger bits into it. I plan to server vanilla bean ice cream with it. Fingers crossed. Hi Paula, you should leave it to completely cool before putting on a plate because the steam will make the bottom go soggy. If you have a cooling rack, wait 20 minutes from the oven and then invert it on to that. Hope that helps! The directions say to cool 10 minutes before removing from the bundt pan. Just made this cake and it turned out beautiful!! So easy to make too! Thank you so much!!! I have made this before and it is wonderful. Today I am making one to take to a family that is sick. I used a Ghirardelli brownie mix with chocolate chunks and the cake mix and made a two layer cake with buttercream frosting for my daughter’s birthday-it was absolutely delicious- I followed the recipe exactly. Thank you for the recipe!!!! 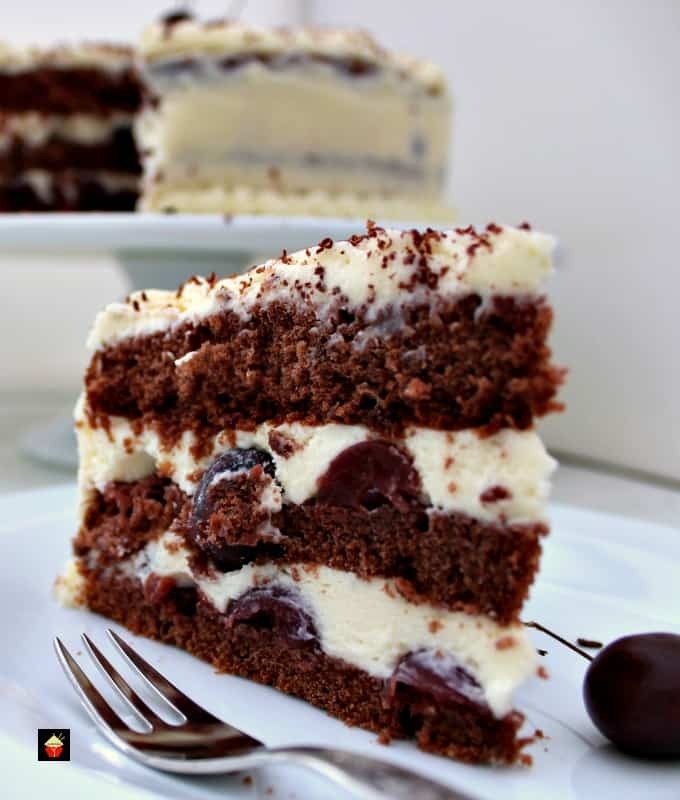 I would like to make a traditional cake with this recipe using two cake pans and buttercream frosting – will this recipe work with two cake pans and taste good with the buttercream? Hi Teresa, yes that should be fine. Just remember to reduce the cook time, I would estimate approximately 20 – 25 minutes if your pans are shallow. Teresa, did you end up making this in a regular cake pan? Wondering if it turned out OK. Yes I did – I made a traditional birthday cake 2 layer 9 inch round with vanilla buttercream frosting I broke up bits of chocolate to decorate the cake on top. the cake was absolutely delicious I didn’t change the recipe just the pans. It came out perfectly moist and very chocolatey everyone loved it . Made this cake for a birthday & it was a big hit! Definataly will be my go to cake, followed the recipe & it came out perfect! Thank you for sharing this recipe! My daughter asked for a brownie chocolate cake, this did not dissapoint. It was for her bday so I chose a different frosting and was highly disappointed. I will make this again but will use what you suggest for frosting. 😊Thanks for posting this! Thanks so much for this recipe. Made it while visiting my grands. The whole family loved it! I’ve been reading your comments and I’d like to make a few suggestions. When you say you followed the recipe completely, you have to remember that all ovens heat differently.if it says baking time is 50-55 mins. Start checking at 45 mins. I also have a oven thermometer to check and make sure it’s the same as you set the oven on when it comes up to temp. I would say, try it again, it’s worth it. I would love to know how you add the cream cheese filling! I layered half of the batter in the bottom of the bundt, put a layer of cream cheese filling (recipe I found on Pinterest) then put the rest of the batter on top. Baked for the same amount of time. It was delicious! I added a cream cheese filling! It was amazing!!! This cake is absolutely delicious! A real chocolate lover’s delight. And the easiest Christmas dessert I’ve ever made. The only deviation from the recipe is that I wanted to serve it warm, so didn’t frost it until right before serving. I had made it ahead of time, and put it on a cookie sheet and used the oven hangover heat from cooking the beef tenderloin. Put it in the oven right as we were sitting down to dinner, and when we were finished eating, it came out nice and warm. I used the whole tub of frosting, topped it with crushed candy canes, and served it with Blue Bell Peppermint ice cream. It was quite a hit. Made it just like the recipe listed, except added some mini chocolate chips to the batter – delicious! Everyone said it was so moist and yummy. I would definitely make this again, thank you! I’ve made this cake several times now for various events. It’s always a hit! Delicious!! Thanks for the recipe! It was a hit!! I used Coffee instead of water to enhance the chocolate flavor. I used a 1 cup of vegetable oil and 1/4 cup melted butter. 1/4 tsp salt and 1 tsp vanilla were also added. Very moist. Will make again! Thanks for the recipe!! Mine was very crumbly. I had to sub butter as I was out of oil. Otherwise YUM! I have made this wonderful cake twice now. Both times it turned out great…its delicious and everyone..at work and at home, loved it. Generally you can always change pan shapes. It won’t need to bake as long, though, so watch it carefully. Im being sent back to the store for the chocolate cake mix…I have everything else…my husband is a chocoholic. Im sure he will love this. Love this cake, so delicious and easy to make. The only problem I had was not knowing from the instructions how long to mix the ingredients. Knowing that you should beat/mix the cake batter, I gambled and gently beat the ingredients with a mixer on medium speed for 2 1/2 minutes. Also instead of 1 cup oil, I used 3/4 cup oil and 1/4 cup butter—it’s a personal thing, I just can’t bake without real butter 😆 Cake came out perfect. Will definitely make this again. I had no problem with spill over or the cake falling. I did change it to yellow cake mix and dark chocolate fudge brownie mix, only because not everyone in my family like chocolate. I also did a caramel toping. I noticed this is not your first snotty comment on this site. You must be a miserable person with way too much time on your hands. Not happy with this recipe! Followed recipe exactly and at end of cooking time, it totally collapsed in the bundt pan when I removed it from the oven. Waste of ingredients! THE SAME THING HAPPENED TO ME. Very upset with this recipe. I just baked this and it was perfect. Hello nanny, can I substitute the water with milk? I used half and half instead of water and it came out really good!! I couldnt find the brownies listed at the store so I bought a pillsbury fudge kind. Will that work? Hi Courtney, sure you can. So long as the quantities are the same as the recipe. Hi Patty, You can use whatever you find easiest. I’ve used by hand and also a mixer and both have come out well. Thank You! I used a mixer and it came out fabulous! Thanks so much for a wonderful recipe! Am making two more today! I purchased the Duncan Hines Decadent Fudge brownie mix like suggested. The mix came with a fudge packet. Do I use it, or just toss it? I used the fudge packet and it turned out delicious!! Wonderful recipe and REALLY easy. No overflow problems, either. I sifted a little confectioners sugar over the top for a bit of contrast. So tasty! Perfect! I wouldn’t change one single thing! Thanks Nanny! Followed directions but cake came out a little dry, any suggestions? I know some Bundt pans are 9″ and some 10″. Maybe the people with “overflow” problems are using 9″ size?? Hi Judith, the pecans sounds really nice. I think some of the ‘overflow’ problems are because people are adding the wet ingredients which are stated on the packages of the cake mixes IN ADDITION to what Nanny has in her recipe. You mustn’t do that. Just use what is exactly in the recipe here. Hope that helps! 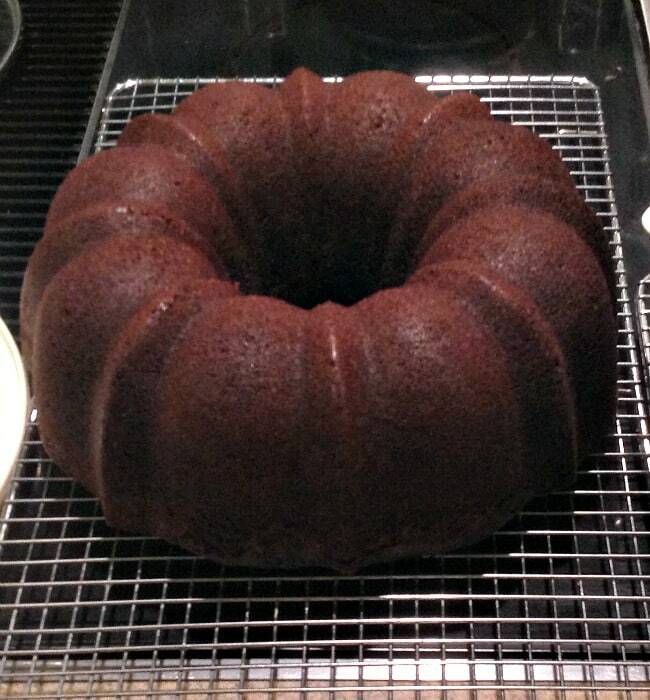 To prevent your cake from overflowing, divide between two bundt pans, and bake for 35 min(give or take a few). Wish I’d read this comment before the cake went in the oven! I am baking challenged so I have a question about step 3. I know I want to let the cake cool completely before frosting it but how long do I wait until I can remove the cake from the bundt pan? Hi Sue, as a general rule, after baking, leave the cake for about 5 – 10 minutes in the pan. That will allow the cake to relax and not risk falling apart when you remove it. Do this for all your cakes (unless it is a chiffon or Angel food cake.. those are different). Then the cake must be completely cool before frosting, simply because otherwise, the frosting will melt on the warm cake. Hope that helps! I would wait for a couple hours, honestly. I tried it after an hour, one time, and it came apart. It needs to completely cool to come out of the pan in one peice! Jenn, you are hilarious! You say everything I think when I read some of the comments. You Nanny’s bundt look awesome!!! I would like to know about your bundt pan. What brand is it? What is it made of? Where can I purchase one? I’ve never seen a white pan and it looks thicker then normal. Can you help? DO NOT put all the mix in the size pan suggested!!! Half of it overflowed, ruined the oven and the cake!! Ridiculous!!!! I just made this with the Pan suggested and it came out beautifully. It fell slightly but still looks great. Debbie… My tummy is rumbling reading your comment! Yummy!!! I used Betty Crocker’s Gluten free chocolate cake mix and brownie mix. Most frosting are already gluten free so that was easy!!!! I can have amazing chocolate cake again!!!!!! THANK YOU!!!!! Yi added some maraschino cherries . Cut them in half. I only had one small bottle but you could use more. Dried cherries would work . The first time I made this cake it baked perfect. The next time I made it my oven had chocolate cake all over the bottom of it! Lol! Oh well still delish! I use 1/2 milk & 1/2 water also about a 1/2 cup of mini chocolate chips….Very yummy!! Great cake I made one change. Not too fond of canned icing. So I made Peanut Butter Marshmellow Cream Fudge and before it set up I drizzled it on the cske then poured the rest in a pan for later. Then I melted just a few maybe a 1/2 cup of semi-sweet chocolate chips and drizzled it over the peanut butter fudge drizzle. Superb. Thanks so much for this awesome chocolaty cake. Do you have recipe for that fudge handy? Hi Shellie, do you have the recipe for the fudge sauce for Dawn below? Yes! Do you have a recipe to share for the peanutbutter marshmallows chocolate frosting? Hello to everyone that’s baked this cake did you guys just add the four eggs for this recipe or did you add more????? Hi Maria, yes it is 4 eggs! I’ll be making to batches of this cake this week end for my sons birthday ..he loves Brownies so I’m really excited to bake this cake ..thank you!! Baked this cake tonight It looks just lie the picture! Took this to a BBQ today it was a huge hit. It was so good a moist and made my house smell so good..
My 18 year old son made this tonight. He loves to bake more than he likes to cook. So moist and Fudgy! We all loved it! Looked just like the picture too. So Easy, my son says. Oh my goodness, I made this today. Ugh, I’m probably going to have to buy bigger pants! I really don’t like things that are too chocolaty but I thought I’d give this a try anyway. I do not have words to tell you how DELICIOUS this is. I don’t know whether to thank you or curse you,lol. Pretty sure this will be my go to recipe to take anywhere. Thanks so much, Rose. but in the instructions, line #3 seems a bit confusing. I just did what I thought would work and it did. Currently pregnant and craving some chocolate. I didn’t have any chocolate frosting but I am subbing Hershey’s cookies n cream frosting. It’s baking and smells amazing! Can’t wait! Love, love this cake. I have made its directed several times, gets get reviews every time. Instead of 1 1/4 cup of water ; I added 1cup of water & 1/4 cup of ” Coffee Liqueur. My boyfriend likes coffee flavor desserts. The directions need to be better for those who are new to baking. Thanks for this awesome recipe! I made it exactly as you directed except i added some chopped pecans. It did not overflow while baking and it was wonderfully moist! My family loved it! Adults as well as the kiddos! This will be a go to recipe everytime a chocolate cake is requested by my family!! I love baking. This was a very moist and delish. I added a little choc chips to the batter. Wow……. Mine just came out of the oven. It smells heavenly and looks perfect. It’s going to be hard to wait until tomorrow to cut into it!! Always best to put ingredients in a bowl to mix well! Would be hard to mix up dry/wet in bundt pan….I used a hand mixer and then poured in greased bundt pan…cooked 55 min. Took out of oven and let set 10 min. then flipped into cake holder to finish cooling before adding icing… Hope this helped! I made this the first time today for a church function tonight..It was a BIG hit! Very moist! I added chopped pecans to mine! Thanks for sharing this recipe! Why put ingredients in bowl? Can you put them right in bundt pan? Unless you have to mix them? No instructions given for mixing. Cool cake in pan??? remove from pan??? again, instructions sketchy. Have you ever baked a cake? You most definitely have to mix the ingredients. You need to grease/spray your pan and if you mix in your pan it will make it stick. And I’m not sure why so many are having trouble with the cooling instructions. It’s really simple. As the instructions read…cool IN PAN for about 10 minutes….then remove from pan. This is a standard cake baking rule. This was very easy and delicious. I took out a little just in case in was going to overflow and did a small round one that will be the base for an ice cream cake. I think it still would have been fine if I had left it in the Bundt pan but this way, I’m ready for dessert #2. This is perfect for when you don’t want a plain cake-mix cake but don’t want to make one from scratch. Thanks! Hi! Thanks for your feedback, and that is fabulous you now have 2 desserts!! Your ice cream cake sounds absolutely delicious and now you’ve inspired me to make something like that. I love the idea!!! I have made this cake twice! It is absolutely GREAT! Moist, chocolate HEAVEN! I just made this cake. If I made it again I would pour half of the mixture in bundt pan, add some ripe banana slices (1 or 1 1/2 bananas), and pour the remainder over the top. It is quite dry. Also I sprayed and floured the pan and had to use a butter knife to loosen it as it wouldn’t release. I used spray Pam. I find sour cream really helps moisture vs saying the water. Great recipe. No problem here. Except it was a little bit dry. Still delicious. Any suggestions to add some moisture? Thanks. Do you think this would make a good layer cake? 2 or 3 layers? Thanks! Hi Tonya, we haven’t had any feedback of anyone trying it as a layered cake, but I don’t see why not. I think for a 3 layer, I would suggest doubling the recipe, and of course the bake time will be less than for a bundt pan, if using shallower baking tins, but do come back and let us know if you try it! Cake in the oven now. It smells DELICIOUS!!!! Wooohooo! Please enjoy Kristen and have a lovely weekend! I’m making this cake tonight for the second time in 5 days! It is absolutely divine! My husband and boys devoured it. If I could give it a million stars, I would. I followed the recipe to the letter and it came out perfect! Hi Kim! It sounds like you have some cake monsters in your house!! So glad your hubby and boys enjoyed it so much. It’s always wonderful to hear back. Have a lovely weekend and happy eating!! I made this cake with a Gluten Free Chocolate Cake Mix and a Gluten Free Chocolate Brownie Mix and it turned out GREAT. I will add a can of cherry pie filling next time to make it a Black Forest type of cake. Hi Bre, Thanks so much for your feedback! I’m glad you took the time to write in and let us know it worked well as a GF option too! The idea of the cherry pie filling sounds really lovely. Black Forest is also one of my favorites! Have you tried it with the cherry pie filling yet? Sounds great?! Yes I did and it was too much. Made the cake too moist. I will use maraschino cherries next time. I Substituted with coconut oil as well, I made two of these cakes. The first one I got vanilla icing instead of chocolate. The second one I made into a Samoa brownie fudge cake. I used la lechera Carmel sauce the whole can mixed with 1/4 cup of evaporated milk and microwaved until the Carmel sauce had melted. I toasted 2 cups of coconut in the oven 350 for about 10 min then mix the sauce with the coconut. Then I poured it ontop of the cake. Once that had harden I melted chocolate chips and drizzled it on top of the coconut mixture. Turned out soo good.! Thanks for the cake recipe. Wow! Kathleen, your changes sound so yummy! I really love the idea of making it in to a Samoa style cake. So glad you enjoyed the recipe and thanks very much for taking the time to write in with your suggestions. Everything sounds so wonderful! Hi Jenn! Thanks so much for writing in and letting us know. The use of coconut oil is very helpful as I’m sure there will be others who might just be thinking if they could use that ingredient! So glad your family enjoy the cake!! My granddaughter wanted a CHOCOLATE chocolate cake for her birthday. I got Betty Crocker chocolate fudge (with the liquid fudge pouch) and a BC chocolate fudge brownie mix with chocolate bits. I used 1/2 cup melted butter, 1/2 cup oil, 11/4 cups of milk with the 4 eggs beaten into the milk. It’s baking now and smells awesome. She wants chocolate mousse on it, so I think I will glaze it with a chocolate gnache then serve with a dollop of chocolate mousse. Gosh that sounds absolutely wonderful Penelope and together with the chocolate mousse… oh boy! Wishing your granddaughter a very happy birthday and thanks so much for taking the time to write in and let us know what you did with the recipe. It sounds so lovely!! I went to two different grocery stores today to get the box mixes. Neither one had a plain Duncan Hines Decadent brownie mix. I purchased the Amaretto. Do you think that would be good? Hi Diane, it’s always the case when you are looking for something and they’re out of stock! If you like Amaretto flavor then it will be perfect. I think the combination will be quite delicious! I found the Fudge Brownie mix at a small grocery store. Yea! Made it last night and brought it to work this morning, my guys can’t stop eating it! Thanks for the recipe! Oh gosh! So glad you managed to get hold of the mix! I guess next time you will need to buy a few boxes… I am imagining the guys at work will be asking you to make the cake again! Thanks so much for taking the time to write in and let us know how you got on Diane. Much appreciated. I made this cake following the directions exactly. It was too dry. I made this cake for my husbands birthday! Anyone that knows me knows I HATE chocolate cake but LOVES brownies. As my husband and I have always had the couples battle of which he thinks.. Chocolate cake and brownies taste the same. To me, it doesn’t. I ran across this recipe and made it. I used a different homemade chocolate icing instead of using the store brought kind in the plastic can. I had a very SMALL piece and I was hooked. I ate this cake several times a day! Even though chocolate cake was part of the recipe, it still tasted like brownies. After sharing this recipe with her, she even made it fir her family and co-workers after I warned her she was going to get hooked on this cake. This will be my forever chocolate brownie cake dessert. Thank you Nanny for sharing this easy, delicious, and beautiful brownie cake!! Thanks very much for the smile Tracy and so happy the cake was a success and you were even converted to enjoying the cake! Happy belated birthday to your husband too. Thank you for taking the time to write in and give us feedback. It is much appreciated! Hi thanks for the recipe. I’m wondering if you would adjust or add some flour for baking this cake at high altitude? I always have issues when baking b/c I am at 4,700 feet. 😉 Thanks in advance. Hi Tiffany, Unfortunately we haven’t had any feedback from anyone so far about if it makes a difference when baking at high altitude. I would adjust, if that is what you normally do with cakes, or perhaps someone here might be able to help and add a comment too. Sorry I can’t be much help on this, but I’d rather not guess in case I give the wrong advice! I’m hoping to make this cake for my sons birthday. i don’t want the cake to stick to the pan, would just spraying cooking spray be ok? Will this also hold up after cutting in half? My plan is to make 2 cakes and form like a snake:), thanks! Hi Amanda, yes and yes to both your questions! How fun you’re going to make a snake. We’d love for you to send in a photo if you have time so we can see. Lovely! The cake is firm enough to hold so you don’t need to worry. 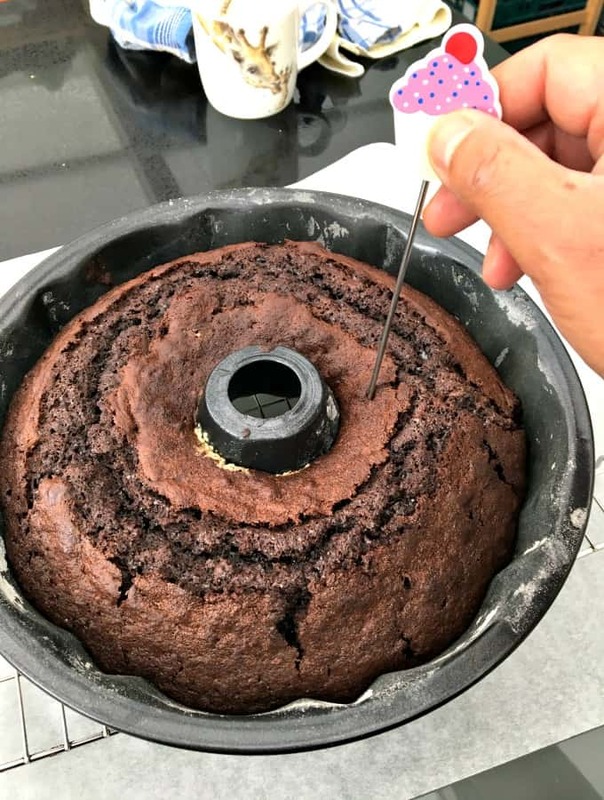 As far as sticking to the pan, yes, cooking spray will work, but if you are really worried, use some butter and grease it inside, inbetween the grooves if it is a patterned bundt, and be sure to allow the cake to cool for at least 10 minutes in the an before turning it out. As the cake starts to cool, it will begin to firm up. Hope that helps and happy birthday to your son! If I used a yellow cake would that make it like a marble cake or do you think that would not work? Hi Tammy, I really don’t know. We’ve only ever made the recipe with the ingredients listed. If you try it please do let us know! Hi Jamye! Don’t panic!! The tube pan is absolutely fine! As for the fudge pack, is that some kind of liquid you refer to, and if so, all you need to do is check the cook time at the end, (stick a skewer in to see if it comes out clean). It may change the time a little and also the consistency might be a little gooey, but then for me that is all good! I think because it is a chocolate fudgy brownie cake, you can get away with ooey gooey. I am pretty sure you will be fine. Please let us know how it turns out, and I’d love a friend like you to bake cakes for my birthday too! My cake came out kind of dry as well. I used a Ghiradeli brownie mix because that is what I had on hand so maybe that is why. I also used powder sugar in place of the frosting to cut down on the richness. Most of my household prefers cakes without icing. I will make this again but use a different brownie mix next time. Hi Mary, in Australia those sized packet mixes aren’t available. Should I just round it up to the nearest packet size available here, or would you recommend measuring the mix to your packet sizes? Hi Helen! Perhaps I should say a very good morning to you! Yes, I would just round up the sizes. You can’t really go wrong with this recipe, if you find after rounding them up, the batter is a bit dry, just add 1 or 2 tablespoons of milk to loosen, but I think it should be fine. Hope that helps and wishing you a great weekend! Hey Helen! Nice to hear back from you and so happy it was a hit! Just wanted to let you know that I used the springform pan and it came out perfect. Time to fully cook to perfection about 50 min in my oven. Let me tell you that it is just delicious! Hope it helps! Oh boy! Thanks so much Natasha for letting us know. It will certainly help others who want to use a different pan. So happy you enjoyed it. Thank you! Oh thank you! I don’t have a Bundt or tube pan so I have mine in the oven in a springform and was hoping it would work out. So glad to see this comment as mine is actually baking right now. I’ve made this cake twice and have been told it’s the best cake I’ve ever made so thank you for the recipe! Both times I’ve it, it’s overflowed in a normal bundt pan. Any suggestions? I put a cookie sheet under it but the last time, it even overflowed from the cookie sheet to the bottom of the oven. Hi Kate, That sounds like a potential messy mess! So glad you were able to pop a cookie sheet under. I wonder why that could be. We haven’t had any other reports of this happening, and there have been so many people who have made the recipe. The only thing I can think of right now is it could be something to do with the type of box mixes you used. I say this because often, they contain baking powder/soda which gives the cake the needed air and rise, but as you can imagine, all brands will have different amounts of those ingredients. But evenso, I still can’t imagine it would be such a fluctuation to cause your cake to volcano! If we do hear of any reports or feedback on this I will pop a reply right here under your comment so you should be able to pick it up to read. I am thinking, in view of it happening twice, it might be a good idea to pop some of the batter in a few cupcake holders so at least the bundt is not as full, or perhaps even use a larger bundt pan if you have? I hate the thought of wasting the lovely cake on a cookie sheet! Thanks for writing in and wishing you a lovely and Happy New Year! I am writing in response to the ‘messy cake’. Check the size of the cake mix package, because there are different size cake mixes. I had this problem with a cake overflowing and this was the reason why. Thanks very much for your advice Antoinette! I don’t have a bundt pan but I was wondering if I could you a 9×9 pan or a nonstick springform pan, or even muffin pan. Please help, I’ve been wanting to try this and now that I have the time I don’t have the pan, which is just a bummer. Anything helps… Thanks! Hi Natasha, yes! You can use any pan which suits. The only thing will be the cook times. 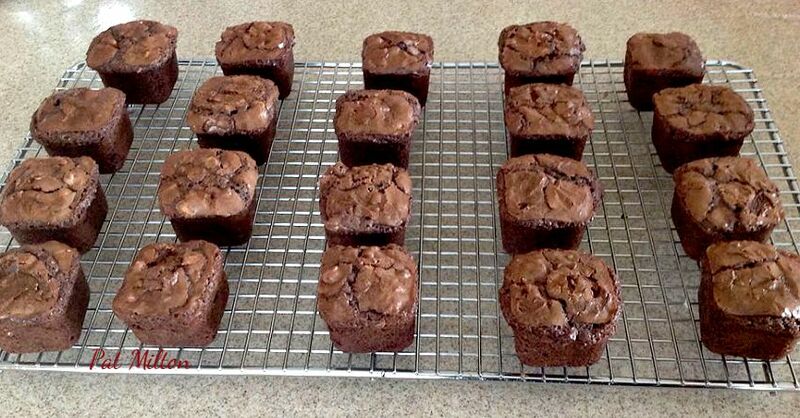 For cupcake pan, around 12 minutes, a regular spring form, around 25 minutes and a sheet pan around 40 minutes. However, these times are only estimates, so please do keep an eye on the bake and check for done-ness. As you know, every oven is different and it is hard to give precise cook times unless we have already had someone let us know. Whatever you try, please come back and tell us what pan and cook time so we can have the information for others too! Thanks very much for writing in and hope you finally get to try the cake. It is wonderful so please do enjoy! My fiance’s birthday is just around the corner. He isn’t a huge cake person but loves fudgy brownies. Does this cake have a heavier feel because of the brownie mix, or does it feel like a normal cake would? Thanks in advance for answering my crazy question! Hi Rebekah! First of all Happy Birthday in advance to your fiance! 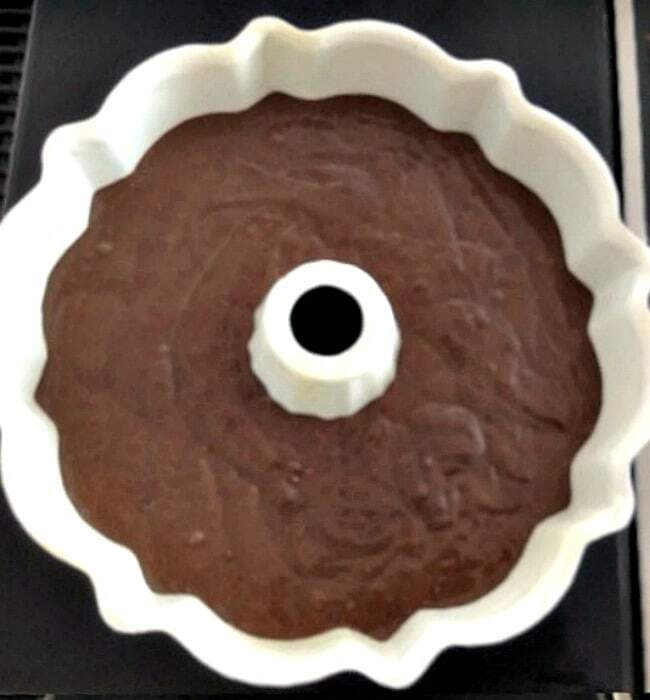 and if you wanted to make a fudgy dense type cake, I would suggest this one, https://lovefoodies.com/chocolate-caramel-fudge-sheet-cake.html . It is a sheet cake, but there’s no reason why you couldn’t make a round one if you fancied. It is very sweet because of ingredients you add after baking, but if you’re looking for fudgy brownie goodness, this will do the trick! Hope that helps and Happy New Year to you! I’m looking forward to trying thus for Christmas, but I’m not a fan of canned icing. Have you ever tried with cocoa buttercream or another homemade icing? Or is the consistency better with the canned one? Thank you! Hope that helps Tami and wishing you and your family a wonderful Christmas! Hi Cindy, you can use whatever suits you. So long as the ingredients are all combined. Hope that helps! How would you recommend freezing this?? Hi Ashlee, for freezing, we would recommend covering in some foil or plastic wrap then placing in an airtight bag, such as a zip lock. Hope that helps! Ok thanks! So freeze it already frosted? Whole or cut in slices ready to eat? Hi Ashlee, I would freeze it whole. I think if you cut in slices it might dry out a bit when it gets defrosted. I can’t be sure, but that is what I would worry about! You can frost it first, or if it were me, I’d just freeze the cake then frost just before serving (just incase the frosting cracks in the freezer). The frosting only takes minutes to do, so for me, I would do that just before serving for a nice shiny look! COULD I MAKE CUPCAKES WITH THIS RECIPE? Hi Laurie! I don’t see why not! We haven’t had any feedback on anyone making cupcakes, but I am certain it would work fine. I suggest you check the cook time after around 12 – 15 minutes or so for done-ness. Please let us know the exact bake time so we can have your feedback to help others in the future too. Have a Merry Christmas and happy baking! My daughter signed me up to bring the dessert to her Girl Scout Christmas party tonight. I asked her what she wanted to bring and said, “Nanny’s cake! 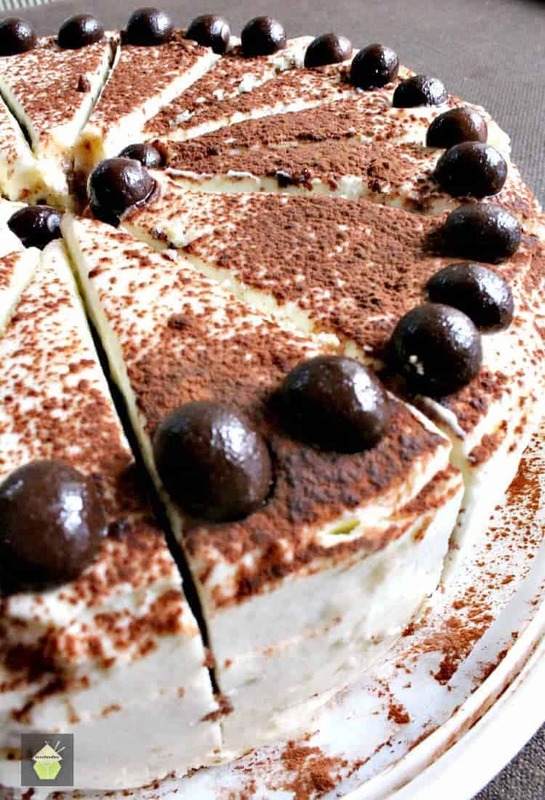 !” Not being a baker it was a relief because this cake is sooo easy and sooo good. I had a Nanny too and she loved a good cake, she would have loved this one. Hi Trisha, That’s wonderful to hear! I’m glad you chose Nanny’s cake for such a special occasion and it is indeed very easy to do. Thanks so much for writing in and letting us know. 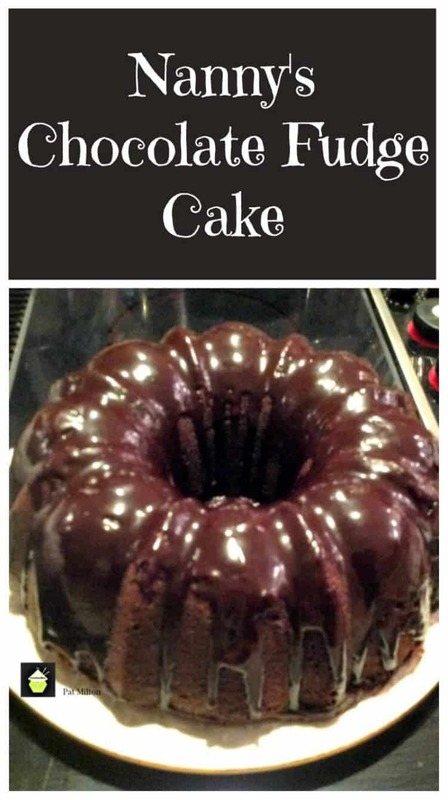 I tried this over the holidays and it overflowed my bundt pan! Oh no! Marie, what happened for the overflow? DO you think the pan was too small? This looks so good and really easy to make but I was wondering if it could be made in a reg cake pan? I don’t have a bundt pan. Hi Ginger! Glad you like the recipe. We haven’t tried in a regular cake pan, however, there is no reason why it wouldn’t work. All you need to do is be mindful the cook time will be a little longer and Bundt pans have a faster bake time. I suggest to go over the cook time in the recipe by 10 – 15 minutes, (check for done ness after 10 minutes extra) and you should be fine. Please do let us know the exact time for you so we can add your suggestion in the recipe for others if they want to do the same! Thanks very much for writing in and have a lovely week ahead! I can just imagine how yummy this cake is with brownie mix!!! This cake was so delicious! Thank you to you for posting and to your Nanny for coming up with the recipe! Hi Renee, So happy you enjoyed Nanny’s cake. She will be super pleased to hear it was a hit! Hi Nancy, Nanny says she hasn’t tried her recipe using the mini pans but suggests you check for done ness after about 25 minutes, use a skewer and see if the centers come out clean. Of course it also depends on the size of your mini pans too, so keep an eye on them whilst baking and do a quick check! Wooohooo! Fabulous Kristina! Glad you like it 🙂 and happy weekend to you and your family and friends! Glad you like it Janet! I would love to have this recipe in a print format so I can be sure not to lose it. Currently it will take 5 pages and lots of pictures. Can you make a print format please? It is very easy to do, if you scroll to the end of the recipe, (after the last photo) you will see the recipe in print format with a print button at the top of the recipe card. Simply click that and it will print exactly what you see in that recipe card. It is such a short recipe too that writing it down is pretty simple. Indeed Sandra! Save the ink and paper and do it the ole fashioned way! Hope you enjoy and happy weekend to you! i been looking for a brownie cake recipe for a cake layer. Can I also use that instead of in a cake bundt ? My 18 year old son is the baker /cook in our house. He whips up more baked goods than me. He thought this was way too easy to make. Wanted to something more challenging. So Fudgy eaten warm! Moistest cake ever! WE all loved it.